After being lost to a fire in 960, the Inner Palace of the Kyoto Imperial Palace was reconstructed multiple times over the centuries. The reconstructions of 1790 and 1855 represented a revival as the main buildings and furnishing were created in the classical styles of the Heian period (794–1192). The Inner Palace rebuilt in 1790 was lost in yet another fire, but the one rebuilt in 1855 stands to this day in Kyoto. The Higyosha, which functioned as the residence of court ladies at the Inner Palace, was also rebuilt on both of these occasions. The works presented here–rare furnishings made in classical styles–are from the Higyosha reconstructed in 1855 and provide insight into daily life at the court. * Works listed below are in the TNM Collection unless otherwise indicated. 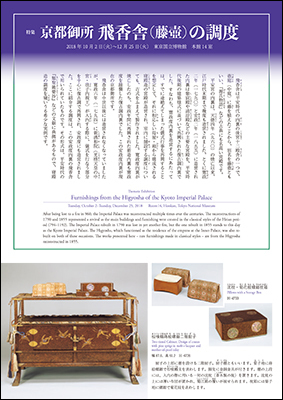 The pamphlet is distributed in Room 14, Honkan during the thematic exhibition periods. 2nd floor "Highlights of Japanese Art"
Copyright©2004-2019 Tokyo National Museum. All Rights Reserved.